Main Prey - Insects such as moths, locusts, and roaches. Whites tree frogs are found throughout Indonesia and the tropical north of Australia. They are large, heavy-bodied frogs, and range in color from maroon, to bright green to even blue! There is often variation among the color of adult frogs based on their origin. Indonesian specimens are more likely to exhibit the maroon and green color phases, while true Australian frogs are usually lime green or blue. It should be noted that any given frog can change its color drastically based on temperature, mood, and time of day. These frogs are nocturnal, typically sleeping during the day, and becoming active at night to search for food. As the name "tree frog" would suggest, this species is arboreal, preferring to live off of the ground. Captive bred baby whites tree frogs are commonly available, and these little guys can be housed in groups of two or three in a standard ten gallon terrarium. They do grow quickly, and should be moved to larger quarters at the discretion of the keeper. A single adult pair will be comfortable in a tank having 20 gallons of volume, with the "tall" models being slightly more desirable. Whites tree frogs are communal, and may be housed in pairs or trios, but close attention should be paid to the size of the animals. Smaller frogs will often be too intimidated by larger cagemates to feed, and in some cases become food themselves. Therefore, be certain that any frogs you are keeping together are of the same size. A diet of primarily crickets can be fed to White's tree frogs. Other items that can be fed include moths, beetles, cockroaches, grasshoppers, and earthworms. Fully grown White's may even take pinkie mice on occasion. Insects can be simply placed in the cage, or offered using blunt (rounded) tip forceps. The amount needed by your frog will very somewhat, but keep in mind that White's tree frogs tend toward obesity, so do not over feed. As a very general guideline, feed large frogs (greater than 3 inches long) a few larger crickets every 2-3 days, adjusting based on the behavior (i.e. acting hungry or not interested in food) and body condition of the frog (see below). Smaller frogs can be offered about 3 week-old crickets every 2-3 days, and juveniles should be fed daily. The best way to judge how much to feed is looking at the frog's body condition. Look for ridges just above the frog's eardrum - if there are no noticeable ridges the frog is likely underweight and should be fed more or more often. If the ridges become prominent and start to sag or fold over, then the frog is obese and should be eating less. The insects fed to the frog should be gut loaded (fed a nutritious diet that is then passed on to the frog - for more information on cricket care, see "Raising Crickets"). In addition, the food should be dusted with a calcium/vitamin supplement (daily in very young frogs, once or twice a week for intermediate sized frogs, and once a week for mature frogs). 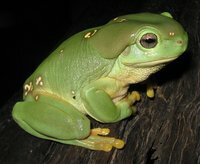 White's tree frogs reach sexual maturity in their second year. Breeding takes place in the summer rainy season. It often takes place in very moist places, such as drainage systems, water tanks, or grassy semi-permanent water systems. The female expels her eggs with such a force that they go through the deposited sperm cloud and stop up to 1.5 feet (.5 m) away. A clutch can contain from 150 to 300 eggs. Once fertilized, the eggs sink to the bottom substrate. Hatching begins about 28 to 36 hours after laying. Metamorphosis can occur in two to three weeks in good conditions. Whites tree frogs are big as far as tree frogs go. Adults may exceed four inches in length, although some specimens are mature at just shy of 3 inches. Once mature, they take on a rather "pudgy" appearance, and a large individual could easily fill the palm of a human hand. When properly maintained and given a balanced diet, captive raised whites tree frogs can live nearly 20 years! White's tree frogs are quite sedentary and docile, and can become fairly tame and tolerate handling. Remember however that amphibians have very sensitive skin and absorb chemicals through their skin, so extreme care is needed when handling (wash hand thoroughly with warm water and rinse well - natural oils and salts found on human skin can be damaging, as can any soap or lotion residue). White's tree frogs in the wild spend most of their time in trees, and need an enclosure with lots of climbing room. A minimum 25 gallon aquarium is recommended, and the arboreal type (tall rather than wide, often hexagonal) is better. A tight fitting lid is essential, as these frogs have foot pads that will let them easily scale the side of any aquarium. More than one can be kept in a tank, as long as they are of similar size (otherwise the larger ones may eat the smaller ones). Larger pieces of bark, large sized gravel, or soil can be used, and can be covered with sphagnum moss (which will help retain moisture for humidity). Avoid small sized gravel or bark or the frogs may accidentally ingest it. Some keepers prefer a more bare approach, simply lining the tank with paper or paper towels to facilitate cleaning (it is a bit harder to maintain the appropriate humidity this way, though). Provide lots of branches, large pieces of cork bark, and foliage for climbing - keeping in mind that it needs to be quite sturdy to support these stocky frogs. Live plants can be used, although they must also be sturdy and they must be free of fertilizer or pesticide residues (on the plant or in the soil). Live plants in the terrarium can be kept in small pots to make cleaining the tank easier. Placing a large piece of bark diagonally across the cage, a couple of inches from the back wall will allow the frog to hang from the back of the tank under the cover of the bark to sleep during the day. Alternately, any sort of thick plant cover or hide that allow the frog to hide during daylight hours can be used. Covering the back surface of the tank with dark paper will help the frog find a secluded and dim area to sleep during the day. A piece of paper a couple of inches tall placed around the bottom of the tank may help if the frog tends to rub its nose along the glass to try and "escape." Because these frogs are nocturnal, there are no special lighting requirements (i.e. exposure to UVB is not necessary, although some exposure won't hurt). However, a basking light or heater should be provided, outside of the cage, to provide a gradient of 80-86 F (27-30 C) during the day, with a drop to 72-78 F (22-25 C) at night. As always, use a thermometer to confirm that appropriate temperatures are provided. Lighting should be subdued (and if needed at night, use a nocturnal bulb), and a regular light-dark cycle should be used (12 hours light and 12 hours dark should be acceptable). Humidity should be maintained at about 50-60% The tank should be misted daily with dechlorinated or bottled (not distilled) water. A dish of water should also be provided. Frogs like to get into water to rehydrate and soak, so it should be large enough that the frog can comfortable sit in the dish, but not too deep that there is a risk of drowning (tree frogs are not strong swimmers). Do not use fresh tap water with frogs and other amphibians, due to the chlorine used in the water purification process. Water provided in the dish and used for misting should be allowed to sit in an open container at room temperature for 24-48 hours ("stale" water), and ideally treated with a dechlorination kit available at pet stores. Alternatively, bottled water can be used, but do not use distilled water. Your frog's cage should probably be spot cleaned every day, wiping off any large bits of waste matter from the plants and bottom of the tank. The water in the dish should be changed daily or at least every other day. If paper is used to line the cage, this can be changed often. If bark or moss is used, it can be taken out an washed as needed - the more often the better. Soil should be changed as needed. Plain hot water is the best choice for cleaning - with soaps or disinfectants there is a chance of leaving residues which could be absorbed through the skin and harm the frog. If disinfection is necessary, rinse very well and dry thoroughly. Replace any water with stale, dechlorinated water. Due to their fragile skin and nervous nature, most frogs should never be handled. However, whites tree frogs are a great choice if you simply must handle your frogs. Although it should be done only with clean, moist hands, and only occasionally, these frogs can be handled, and will tolerate short periods of human interaction.